My mom adores doing Random Acts of Kindness. It fits her personality so well. Every time I’m around her friends, they tell me that she’s so sweet and thoughtful. I completely agree. My mom is a sweetheart. I don’t know why it didn’t occur to me sooner, but mom and I decided to be Trail Angels during our upcoming camping trip. Trail Angels make Trail Magic for long distance backpackers. Trail Magic can be a Random Act of Kindness like giving a ride, some food or any other kind of gift to a thru hiker. 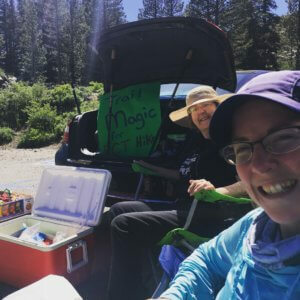 Mom and I tailgated in a trailhead parking lot for the Pacific Crest Trail, feeding hungry hikers. Mom and I eagerly sat in our chairs waiting for the next hiker to come down the hill, heading our way. We couldn’t wait to meet them! We were like little old ladies, waiting for the grand kids to visit so we could feed them until they couldn’t breath. By this point, the backpackers had walked 1,077 miles from the California/Mexico boarder up to this parking lot at Highway 88 near Carson Pass. Having hiked 1,077 miles is a huge accomplishment, and yet, the backpackers still had 1,573 more miles to go until reaching Canada! But we didn’t focus on that. Instead we offered these courageous individuals cookies and chips and chilled plums and watermelon. One hiker had been fantasizing for days over eating fresh watermelon. And another hiker tried her very first plum! It was especially rewarding hearing that other than the day before, they hadn’t had any Trail Magic in 400 miles! It was also fun cheering these hikers onto their goal of making it to Canada. We also made some friends, who we’re follow on youtube and Instagram! As a future PCT hiker, I was very inspired hearing the hikers’ stories, learning about their gear and getting to meet so many people who are living my dream. It was very fun, easy and rewarding being Trail Angels. We feed about 32 hikers in a four hour period. I knew they’d be there because, 1) they need to be at Lake Tahoe by July 4th if they want to make it to Canada before it starts snowing and, 2) I called the local Ranger station and asked how many PCTers where coming through. I also asked where was a good trailhead to set up at. I should have inquired what time of day the most hikers come through, but it all worked out. It’s like I’ve unleashed a beast and mom has now read and watched the PCT backpacking movie Wild. Mom is all sorts of jazzed and she keeps saying that she’d never heard of Trail Magic before and now she can’t to do it again soon! We are making plans to gift the Southbounders with some magic this summer! What do I need? A map.